Look below the map to see information for your location, or enter another location. 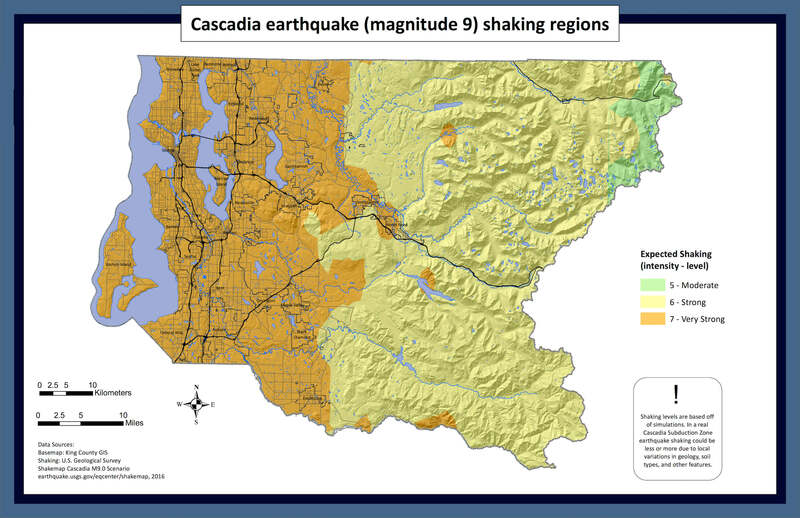 Scientists cannot predict when an earthquake will happen so be aware and if you feel shaking, drop cover, and hold on. An early warning system is currently being developed for the West Coast. You can find out more here. PRACTICE - Be aware and practice "Drop, Cover, and Hold On"
PREPARE - Secure items that could fall and know the location of utility shut offs. INDOORS - STAY THERE! Take cover under a sturdy desk or table away from objects that could fall on you and hold on. DON'T run outside before shaking stops. OUTSIDE - GET INTO THE OPEN away from buildings, power lines, chimneys, or things that could fall on you. DRIVING - CAREFULLY STOP (not under a bridge, overpass, power lines, etc.) and STAY INSIDE VEHICLE. NEAR THE OCEAN - Follow guidelines above until shaking stops. Then HEAD FOR HIGH GROUND. PREPARE FOR AFTERSHOCKS (earthquakes that follow the main shock are common and can cause more damage than initial quake). Phone lines will be overwhelmed; texting can be a good way to communicate with family. Once safe, check news reports via battery operated radio, TV, social media, and cell phone text alerts for emergency information. Emergency responders will be busy. Depend on your friends and neighbors for support during the hours and days following an earthquake. Control utilities if necessary. Find out more about when and how to control gas and water after an earthquake. 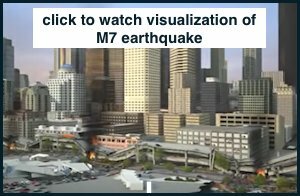 Watch this video to find out more about what to do DURING and AFTER and earthquake. 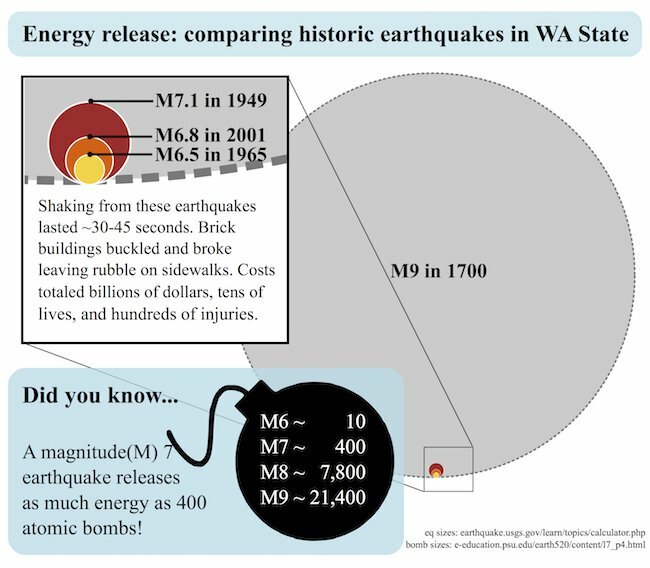 Since 1870, 15 large earthquakes (greater than magnitude 5) have hit Washington State. Native stories also tell of a great earthquake (greater than magnitude 8) and tsunami that followed in 1700. This is outside the high-risk flood areas> (map). BUT if you live near a creek or small river be aware that it could flood too. See the River and Floodplain Management website for more information. Severe storms are expected to increase in the next 50 years.They will bring with them rain and snow. 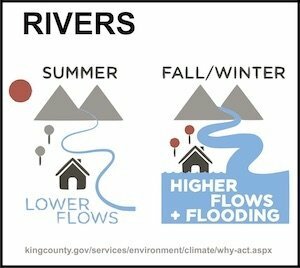 Rivers will have higher flows leading to more flooding in the Fall/Winter. Click the image to find out more. Has it been raining hard or for many days? 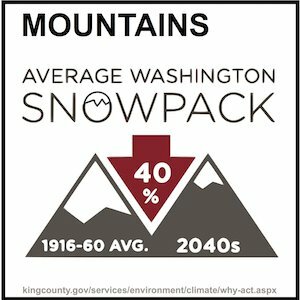 Have rising temperatures been causing rapid snowmelt in the mountains? Do water levels in local rivers look high? Chances of flooding could be increasing. Check news reports by the weather service for local alerts. PLAN - Make a plan of what to do and where to go if waters rise. Have essential items ready (birth certificates, important documents, photos, etc). Acquire flood insurance if you need it. PREPARE - Store valuables and household chemicals above flood levels and learn how to turn off utilities (water, gas, and electricity). LISTEN - Listen to the news and if advised, evacuate to higher ground. AVOID HAZARDS - DO NOT wade or drive through floodwaters. It only takes 6 inches of moving water to knock you down and 2 feet to sweep a car away! If your home has been flooded, be wary reentering it as it could have structural damage. Have a professional check utilities before turning them back on. Document losses by photographing damages and recording repair costs. 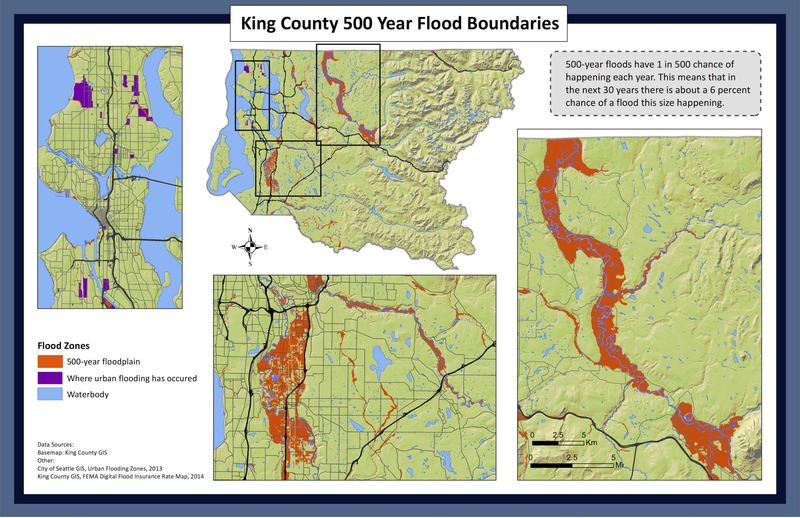 With the many rivers in King County flooding is common during periods of heavy rainfall or rapid snowmelt. 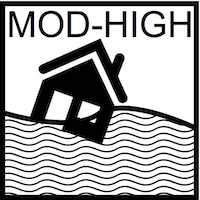 Flooding is most common from November to February, but can happen whenever the conditions are right. Landslides often happen along ocean-side bluffs from waves buffeting coastlines. Puget Sound waters have risen 8 inches since 1913! With higher water levels the potential for bluff erosion will increase. 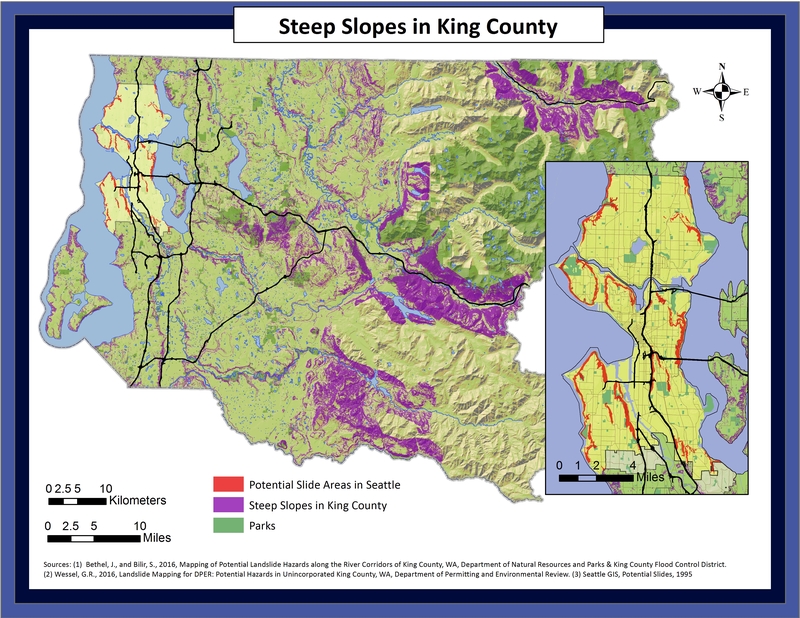 Excess rain from severe storms could also weaken steep slopes triggering more landslides in King County. Click the image to find out more. Do you hear sounds of cracking wood, boulders knocking together, the groaning of ground? Do you see cracks in the landscape and downslope movement of land, rocks, and vegetation? It could be a landslide. Move to stable ground. 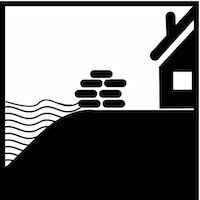 ASSESS - If the area around your home may be prone to landslides seek advice of geotechnical experts. They can evaluate landslide hazard and/or design corrective techniques to reduce landslide risk. BE ALERT - Listen for unusual sounds. Intense, short bursts of rain may be particularly dangerous, especially after longer periods of heavy rainfall and damp weather. CONSIDER LEAVING - If you are in areas susceptible to landslides and debris flows, consider leaving if it is safe to do so. If you decide to stay home, move to a second story if possible. NOTICE STREAM LEVELS - If you are near a stream or channel, be alert for any sudden increase or decrease in water flow and for a change from clear to muddy water. These could indicate landslide activity upstream. DON'T DELAY! Save yourself, not your belongings. You can find more landslide tips from USGS here. BE PREPARED FOR FLOODING (landslides often block rivers and can cause rivers to back up and flood). Stay away from the slide. Other slides can occur after the main slide. Once it's safe, check for injured and trapped people. Check for damaged utility lines and report any damage to your utility company. Listen to local media or NOAA Weather Radio for current information. No studies have been completed here to identify if historical landslides exist (map). 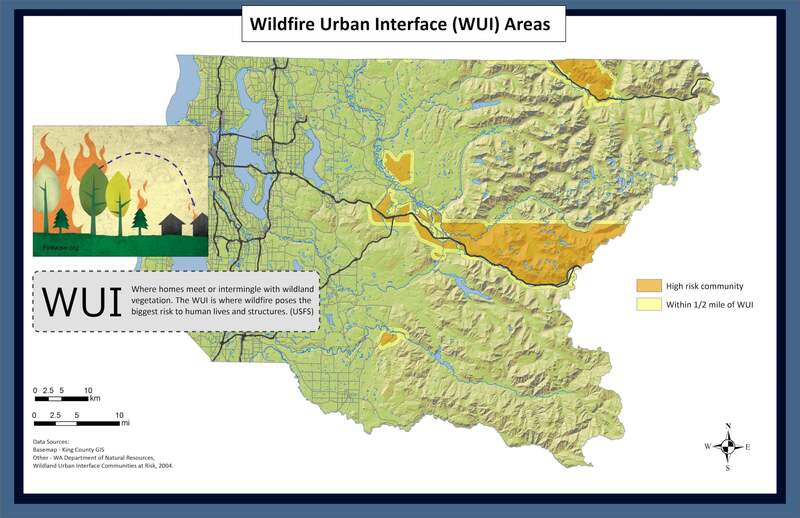 It's unlikely, but if you live near a forested area you could experience wildfire. SMOKE from distant wildfires can travel far and can be a factor even if none are burning nearby. Check on your local air quality here. 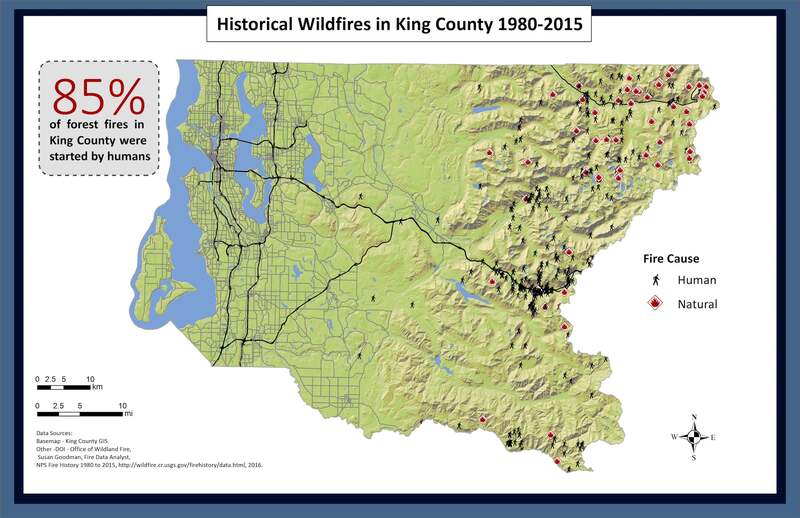 The number of wildfires in the Pacific Northwest has already increased significantly in the last few decades. This trend is likely to continue with drier and stormier summers (think lightning that sparks fires). Large areas of forest could burn and put smoke into the air. Click the image to find out more. Do you smell or see smoke? Has it been a stretch of dry weather? It could be a wildfire. Steer clear of active fires and if you see one start call 9-1-1 to report it. MAKE SPACE - Protect lives and property by creating a fire-adapted space around your home, shed, and business. To find out how check out firewise.org. WATCH WEATHER - A few sunny days can dry out forests enough to catch fire. Windy conditions can cause wildfires to get out of control quickly. STAY TUNED - Listen for local emergency alerts on the radio and/or television and be ready to evacuate if necessary. REMOVE FLAMABLES - Remove materials from around your property that could catch fire (lawn chairs, tables, etc.). PREPARE YOUR HOME - Move upholstered furniture away from windows. Close doors and windows, but do not lock them. Return to your home once authorities say it is safe. Use caution when entering burned areas as hazards may still exist. Check and re-check for smoke or hidden embers. Photograph damage for insurance purposes. 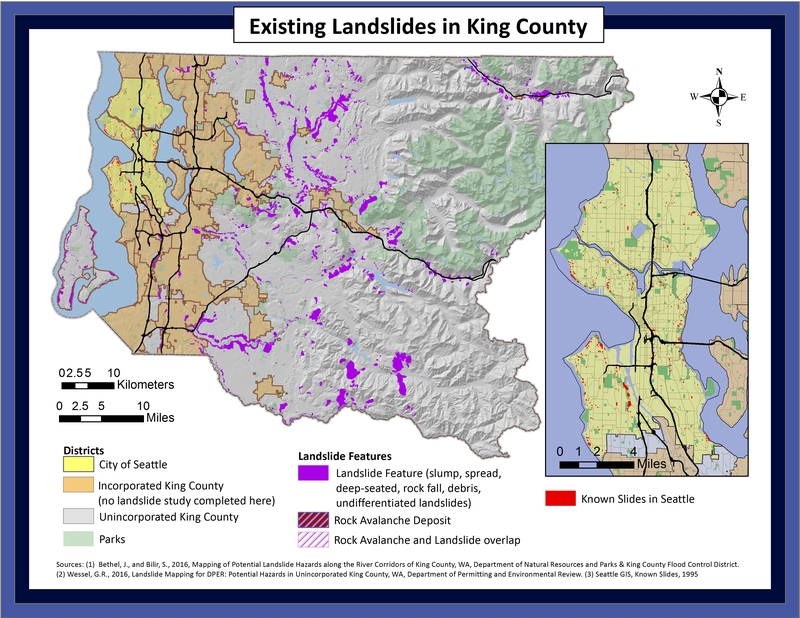 If you think your property could be at risk King County has information for landowners, incentive programs, and host training workshops. You can find out more here. 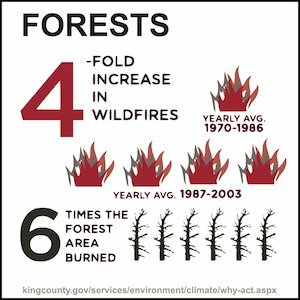 Eastern King County has small forest fires each year. Typically humans are the cause. Take a look at where fires have happened in the past by clicking here. Lahars (volcanic mudflows) are the main hazard associated with Mount Rainier. 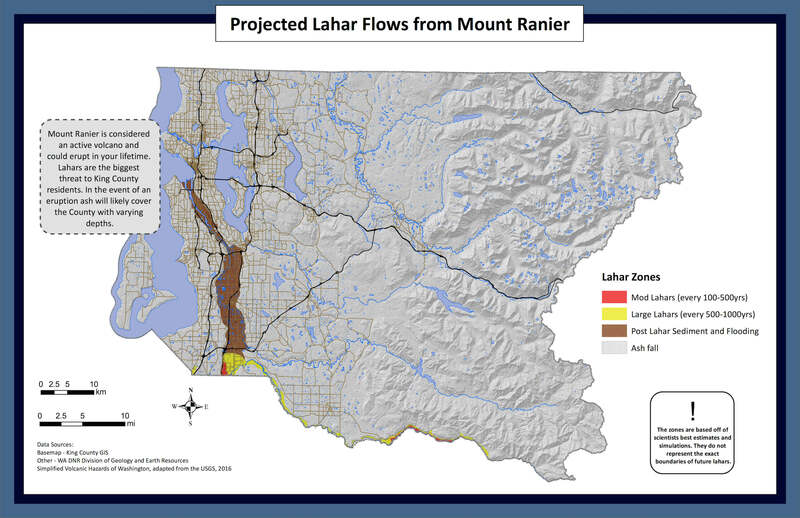 South King County residents have a 1 in 10 chance of experiencing a lahar in their lifetime. Mount Rainier is considered an active volcano, but it could be many years until it erupts again. Volcanoes typically provide warning signals days to months before they erupt. Gas and earthquake activity increases and the ground surface swells as magma moves beneath it. Though these signs may be imperceptible to the general public, Mount Rainier is monitored continuously by scientists with the USGS Volcano Hazards Program. 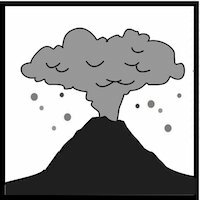 ASK - Find out what steps local officials have taken to prepare for volcanic events. Ask public officials what their plan is and how they will communicate with you during an event. You can do this by contacting the King County Office of Emergency Management. PLAN - Talk to your friends and neighbors. If you are in a high risk zone, decide where you would go, what you would bring, and who you would contact. 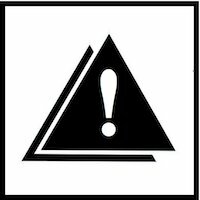 During an eruption, listen to the news for emergency updates and follow emergency instructions. IN LAHAR ZONE - Get to higher ground immediately. OUTSIDE - Cover your mouth, nose, and body to avoid irritation. Find shelter. INSIDE - Keep doors and vents in home closed and stay indoors, unless directed otherwise. Place damp towels at door thresholds and tape drafty windows. Keep car and truck engines off to avoid damage from ash congestion. Protect animals and machinery by bringing them inside or in a covered area. After the immediate danger from an eruption has subsided, cleaning up the ashfall will be the main event. Wear goggles and a face mask when outside. Air quality will be poor. Ashfall is very heavy and can cause buildings to collapse. If safe to do so, clear ash from roofs and rain gutters. 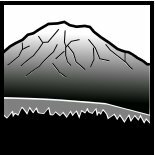 Mount Rainier has had a long history of eruptions and lahars.About 500 years ago the Electron Mudflow surged downhill travelling through Puyallup and as far as Sumner, WA. In the thousands of years before that many lahars travelled along local rivers reaching as far as Auburn. Some towns (NE Tacoma, Orting, and Puyallup) are built on historical lahar deposits. Lahar (dark deposit on the snow) originating in the MountSt. Helens Crater after an explosive eruption 1982. The lahar flowed from the crater into the north fork of the Toutle River and eventually reached the Cowlitz River 80km (50mi) downstream. Across King County winter can bring below freezing temps, icy roads, and the potential for major storms. Snowfall occurs occasionally, with more at higher elevations. Winter storms can bring high winds that cause trees to fall and power to go out. A substantial snow fall event could cause significant disruptions to transportation, public safety services, and utilities. Power could be out for many days. The Pacific Northwest will see more severe storms in the next 50 years. They could carry heavy winds, torrential rainfall leading to flooding. Winter activities will be impacted. 2015 saw the lowest recorded snowpack levels with only 4% of the average. Warm winters will set the stage for statewide drought. Click the image to find out more. Meteorologists have made great strides in forecasting snow and ice storms. 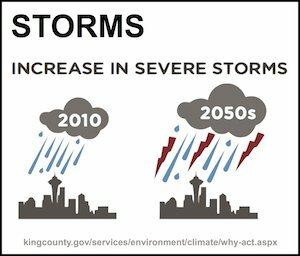 Pay attention to local weather forecasts and sign up for available alert and warning systems (Alert Seattle and Alert King County) to ensure that you get up to date information about pending severe weather. GET SUPPLIES - Store extra fuel and emergency supplies to survive several days without electricity, heat, and hot water. Consider purchasing a generator and follow safety standards. WINTERIZE YOUR HOME - Install storm windows. 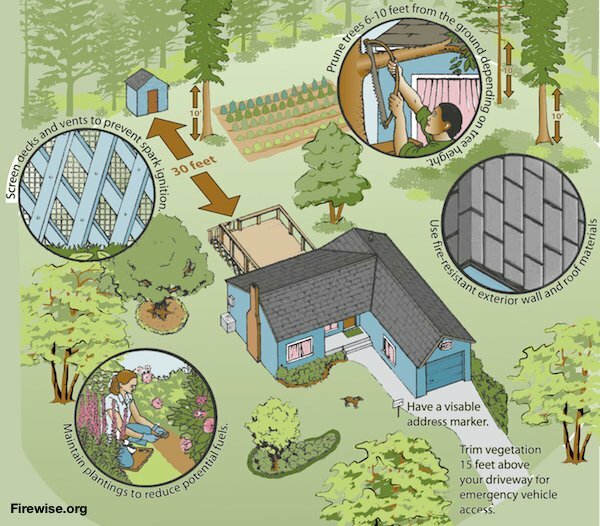 Insulate walls, attics, and pipes. Apply caulk and weather-stripping to doors and windows. Allow faucets to drip a little during cold weather to keep pipes from freezing. Learn how to shut off water valves (in case a pipe bursts). WINTERIZE YOUR VEHICLES - Keep fuel tanks at least half full. Have the battery, ignition system, radiator, lights, brakes, and tires checked. Fill reservoirs with antifreeze, oil, and window washer fluids. Keep winter weather emergency supplies in your trunk. STAY INFORMED - Monitor local news on your TV, mobile device, or battery-operated radio. Follow emergency instructions and pay attention to travel advisories. AVOID TRAVEL - If you must drive, fill the gas tank, stay on main roads, and keep others informed of your itinerary. Slow down. If stranded, call for help, turn on hazard lights, and remain with your vehicle. Don't set out on foot unless shelter is close by. Hypothermia - If you notice signs get medical help immediately. For symptoms and other information click here. Carbon Monoxide Poisoning - It happens when fuels like gas, oil, kerosene, wood, or charcoal are burned in an enclosed space. Hundreds of people die accidentally each year. Find out more here. AVOID HAZARDS - Steer clear of fallen power lines, flooded, roads, and other structures weakened from heavy snow or ice. Improve your family plan - What worked? What could be done better? A series of snow, ice and rainstorms beginning on Dec. 26, 1996, caused 16 deaths in the state and $57 million in damages in Seattle and King County. Two storms — one dumping 6-12 inches and the other 10 inches of wet snow — were followed by heavy rain which collapsed carports, covered boat moorings, and snapped power lines. Metro transit halted service completely for the first time in its history. Freeze and snowmelt contributed to flooding and landslides during the following week. Are you ready if a storm like this happened again? Don't let the rainy fall and winter fool you, King County summers can be HOT. Sometimes temperatures rise into the 90s for multiple days at a time. Thunderstorms, windstorms, wildfires, and heat waves are possible across the region. Severe heat could last for days causing communities to see an increase in heat-related illness including HEAT EXHAUSTION and HEAT STROKE. The high temps, dry conditions, and increased likelihood for lightning may lead to wildfires. July 2015 was the hottest month ever! 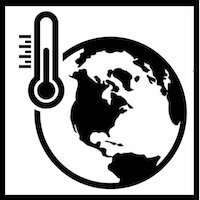 The average yearly temp is projected to increase between 3 and 10 degrees Fahrenheit by 2100. Washington residents will see less summer rainfall, but the rainfall that does happen will be heavier (think downpours). Click the image to find out more. Heat exhaustion and heat stroke are serious illnesses that can occur when a person is exposed to extreme heat. Older adults, young children, and people with mental illness and chronic diseases are at higher risk of heat-related issues. KNOW SIGNS - Heat-related illness can happen quickly. Know and which of your neighbors may be at risk. STAY COOL - Stay indoors and, if possible, in an air conditioned place (shopping mall, library, theater, etc). Limit outdoor activity. PROTECT SKIN - Wear lightweight, light-colored, loose-fitting clothing. A wide brimmed hat, sunglasses, and sunscreen will help. DRINK WATER: Drink lots of fluids (avoid caffeine, alcohol, and sugary drinks) and carry a water bottle. THINK OF OTHERS - Keep kids and pets outside of hot cars. Check on at-risk family, friends, and neighbors often. Use window drapes to cover windows and keep cool air inside. Consider purchasing an air-conditioning system and/or installing weather-stripping in the home where hot air seeps in. LOW-BUDGET OPTION: Build heat reflectors (for use between windows and drapes), such as aluminum foil-covered cardboard, to reflect heat back outside. Click here for DIY instructions. For more information on how to stay cool and safe head to King County's Hot Weather page. In 2015, King County had a record number of days that exceeded 90F. July 2015 was the hottest month ever recorded in King County! It's likely you have most items you need for your family supply kit already. Find out what else to add and get it organized before the next event hits. It's also a good idea to have an emergency car kit. The Seattle OEM website has many great resources for finding out more. Be the first to know what's happening near you. Find out more here. Get real-time alerts about what's happening in King County. Find out more here. Find out more about local resources and information at the King County EM website. 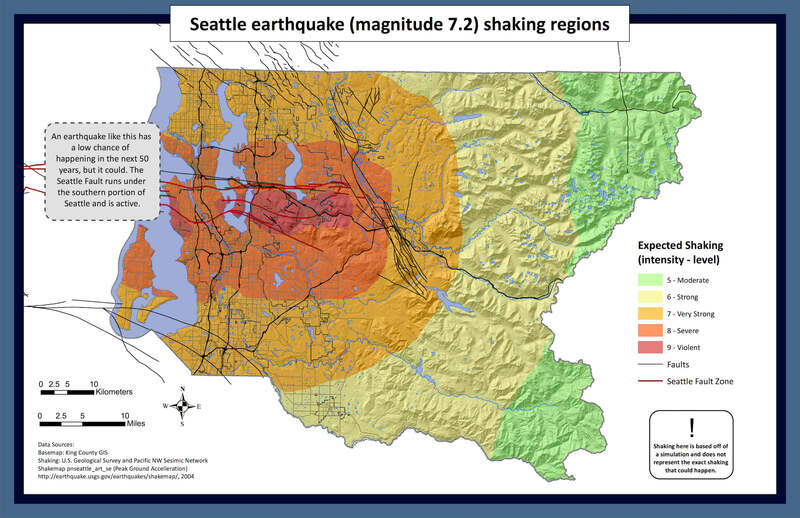 Seattle and King County Ready is designed to help educate and prepare people for disasters that occur in their area. Disasters don’t strike locations equally so we found it important to give location specific information in order to properly prepare. 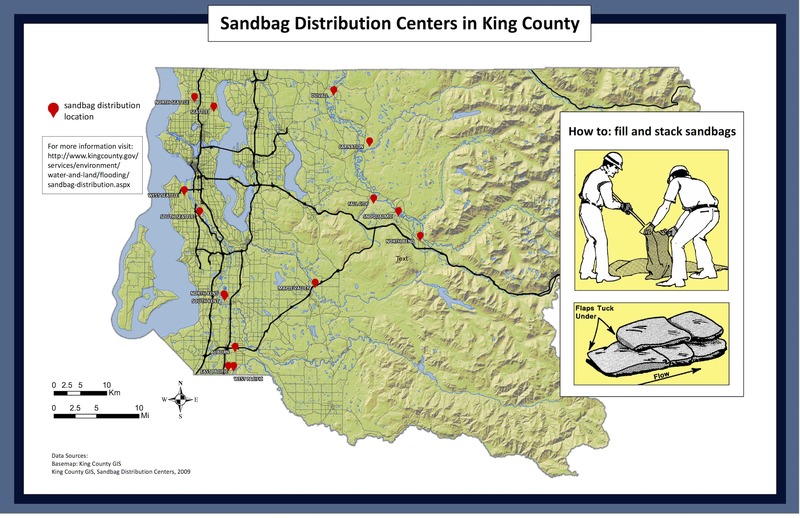 Seattle and King County Ready organizes current information and packages it in a way that makes it accessible for any King County resident. 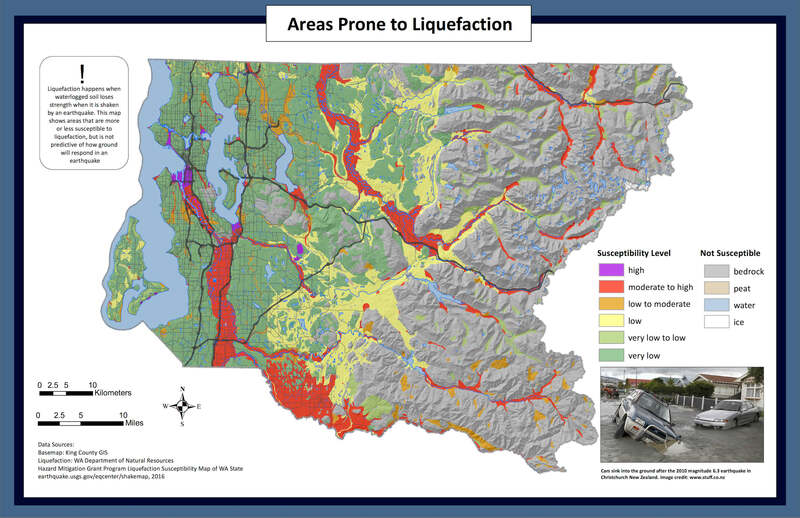 This site uses the most up-to-date hazard risk data available for King County. The user of this site is responsible for verifying any particular information with the original data sources. Although these data represent the best current assessment of hazards, they are not predictive of future events. The descriptions of risk and how to prepare for those risks are based on best information from the American Red Cross and the Federal Emergency Management Agency. 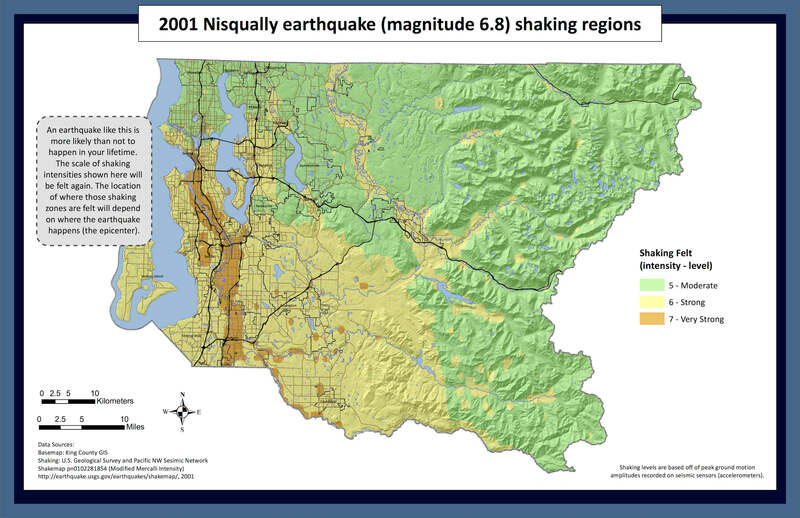 Data used for Seattle and King County Ready is available for download here. Content and data are supported by several entities including the University of Montana, King County, and the City of Seattle.